Everyday, I have done some kind of work on the Camper. It's going slowly more due to supplies needed not so easily found locally. In particular, I have a window I removed the shrunken old rubber seal and have yet to find another that fits. Keep in mind, all this work is done 100% by myself. So while I search out the rubber window seals, I have turned my attention to the roof. WOW, I am NOT enjoying this stage. That old rubber tar gook they put on there is a royal pain to get off. 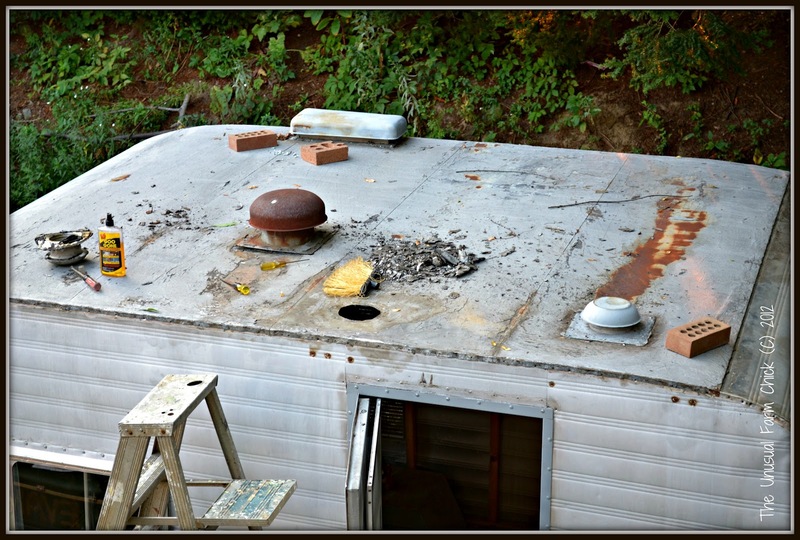 The middle roof is galvanized steel which is why you see some surface rust. That is where the roof sealant had worn away. Not to mention, it's obviously a previous owners horrible handy work (or a pathetic pro job}. I am removing all 4 vents, replacing the middle one with a vent fan, and sealing the rest up. There simply is no need to have 4 vents on a 13ft long camper. 1 was for the closet Loo, 1 is the fan vent, 1 is from once upon a time there was a heater and the other? I'm not sure what that was. I have managed to break down the oxidation from it's shell, hence a lighter grey color I have yet to sand the "dust" off. plus many other little things such as replacing the Butyl putty which sealed the window frames to the aluminum body as well as a few glass inserts and rain drip guards. I have also managed to de rust the door frame & paint with primer. That was a 2 day job. 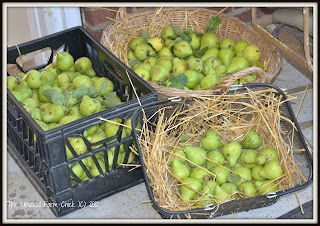 In between all the work over the last few days, I have taken time out to harvest some of our Pears. We have a worker friend of The Captain's coming out this weekend to have his hand at picking some for his family. 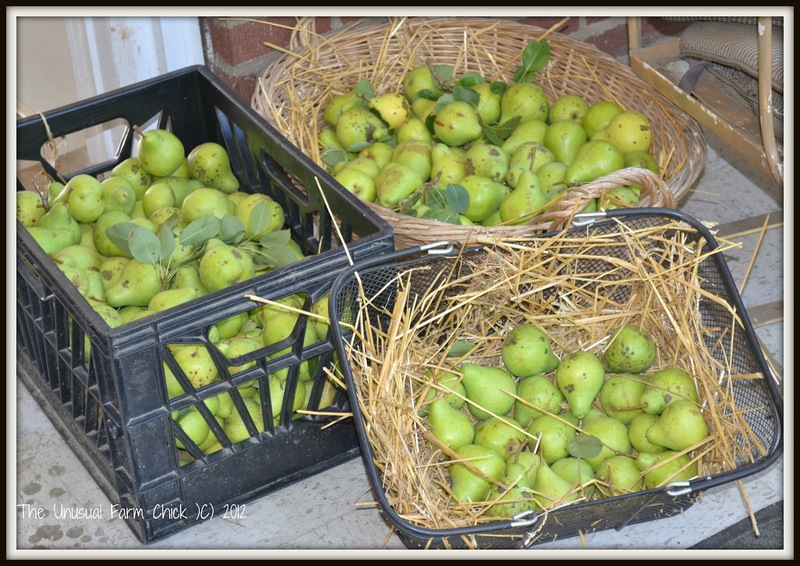 The tree is dripping with pears this year. I am just finishing up what i refer to as the Camper quilt. I found a decent amount of Upholstery fabric sample squares at the Thrift store which were perfect for the making of a patchwork Bohemian quilt. Something to keep in the camper not just as a backup blanket but also for incorporating into it's decor. I promise to share as soon as I have finished the last bits up. I begin working at a local U Pick farm in their farm market on & off site locations this Saturday. I'm really looking forward to get out of the house and be in an environment I enjoy. 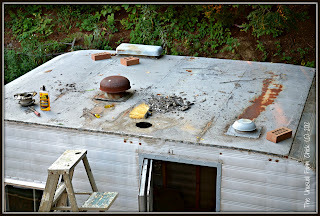 Besides, I have 3 kids to buy school supplies & clothing for on top of all this Vintage Camper work. A paycheck will speed things up a bit. This summer has been rather bland within my blogging mostly due to the lack of road trips & creativity as well as time devoted to my project. I truly must find a way to get a little escape before the warmth starts to fade.